Broncos Legends play charity softball match! The Brisbane Softball Association and Play for a Cure Foundation are teaming-up again with the NRMA Brisbane Broncos for the second Yellow Socks Charity Softball Challenge. All are welcome to attend this one-of-a-kind charity event which will be held at the Downey Park Softball Complex, Green Terrace, Windsor, on Saturday 11th February 2012, from 11.30am. Admission is free but a gold coin donation on entry will be appreciated. The Broncos team will comprise a star studded lineup of Broncos legends including Wally Lewis, Allan Langer, Gorden Tallis, Steve Renouf, Michael Hancock, Tonie Carroll, Micheal DeVere, Kerrod Walters and Chris Johns. 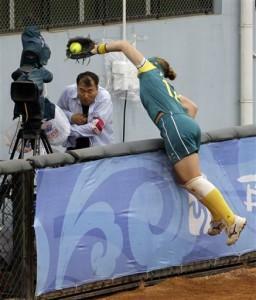 The Aussie Softball All Stars will include all time softball legends Joyce Lester (Australia’s longest serving softball captain), Tanya Harding, Melanie Roche, current Australian captain Stacey Porter and other former national team stars. More details on both teams are in the tables at the bottom of this post. The inspiration for the inaugural Yellow Socks Challenge in December 2010 was the passing of Deb McColm and Jannita Dunn from cancer in late 2009. Both Deb and Jannita had strong ties to the Brisbane Broncos and Brisbane Softball Association, with the pair being avid softball players as well as Jannita being the elder sister of Broncos legend Gorden Tallis, and Deb’s husband, Graham McColm, being a long-time Broncos Kicking Coach. This year, the focus of the Yellow Socks Challenge will be broadened to remembering others who have passed away from or who are impacted by cancer. The teams will again play in yellow socks as this colour is associated with the daffodil flower used internationally as the flower and colour of HOPE for a cure to cancer. In addition to the celebrity softball game, there will be plenty of food, drinks and other fundraising activities which will add to the festive atmosphere of the day. The feature raffle item will be an autographed and framed Broncos jersey signed by six Broncos Club captains – Wally Lewis, Gene Miles, Allan Langer, Kevin Walters, Gorden Tallis and Darren Lockyer. The event will also endeavour to promote the game of softball as a great sport to be active and socialise with friends and family. Play for a Cure is a registered charity established to use playing softball to raise awareness of cancer and to help those impacted through funds raised. 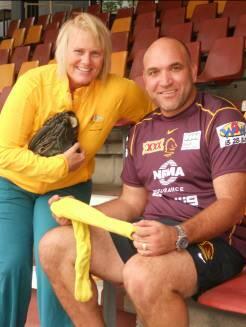 Gorden Tallis is the Patron of this Foundation. This entry was posted on Friday, December 9th, 2011 at 3:05 pm and is filed under 2012, Previous Events. You can follow any responses to this entry through the RSS 2.0 feed. You can leave a response, or trackback from your own site.